Case Logic is obsessed with organization! No matter who you are, what toys, tools or technology you have, where you are, or where you are going, Case Logic is your partner in managing the things that matter to you. We are the -Inch stuff wranglers-Inch that make life easier. 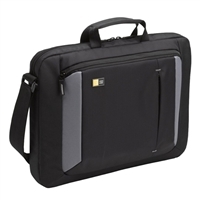 With this focus in mind, Case Logic introduces the VNA-216 16-Inch Laptop Attache (Black). Featuring a slim, compact portfolio, perfect for carrying laptops up to 16-inches without unnecessary bulk. Power Pocket - Streamlined front pocket comfortably fits bulky power cords without deforming the case. Accessory storage pockets for portable mouse, iPod, cell phone and pens. Integrated neoprene USB drive pocket, comfortable shoulder strap and padded handle for easy portability. Luggage strap for easy portability on top of any rolling case. Fits laptops with up to 16-inch screens. 25 Year limited Warranty! 15.2" x 1.8" x 10.8"
16.25" x 2.75" x 13"